These are my thoughts....who am I? 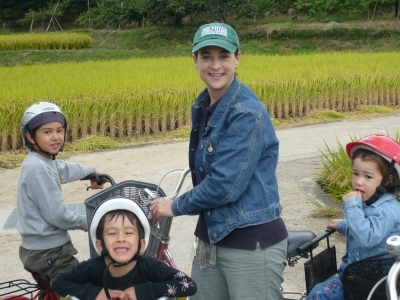 ....an American living in Okayama prefecture, Japan in an international marriage with three children, teaching English at home. Driving in Japan I hardly notice the speed limit. In fact, I don't follow any speed limit, except the car in front of me. When I am on an open road, with no one ahead of me, I hardly even realize I am speeding. Perhaps because I am used to the wide roads, few cars and big, open country spaces of New York State, I feel whenever I drive in Japan I am crawling at a very slow speed. The other day, I was in a hurry, trying to cram five errands into the short time I had before I had to be home to cook dinner and get ready for my afternoon and evening of lessons. I was driving on a back road that runs through the rice paddies. It was a weekday so there was not much traffic. I came to an open space with no traffic lights, pedestrians or any bicycles so I sped through the area. I got to my destination safely and was relieved to find that I had made it in great time. I had more time than I expected - hurray! On the way home, on the same exact road, there was more traffic and several cars in front of me. So my speed was controlled by the car in front of me. The oncoming traffic started flicking their headlights. Hmmm...I thought, in the United States a flicker of the lights means there is a speed trap ahead with police waiting to catch anyone speeding. So the traffic slowed way down. Sure enough, just around the bend, there was a police car with several policemen waiting to catch anyone speeding. Whew! I thought if they were there just 20 minutes earlier, I surely would have been caught! Boy was I lucky!! So the flicker of the headlights is universal...at least in the US and Japan...watch out for those speed traps! Unfortunately my husband wasn't so lucky one week later, on a completely different road, on the way to a tennis game for my son, and afraid he was going to be late, he got nabbed in a speeding trap! Yikes! We went skiing in January, the five of us and some friends. We wanted to leave our youngest (3 years old) home, but with no one available to watch her we decided to bring her along. After all, she had never experienced snow before. A strange concept for me, growing up in the North, I've known snow my whole life. Friends made reservations for us at a minshuku, a Japanese style inn with reasonable prices and the basic amenities. It was a perfect location, just a few hundred feet from the ski lift and in the mountains. We skiied on Mt. Daisen, in Tottori Prefecture. From the ski resort you can see the Sea of Japan on a clear day. Very picturesque. We arrived on a Saturday before noon and skiied the entire day. The boys (Papa included) tried out snowboarding. Our oldest took a lesson and went off with his friends. We hardly saw him, except in passing. He had so much fun. If it wasn't for a friend's dad, we wouldn't have had any pictures of him. Our youngest and I played in the snow, sledding, building snowmen and enjoying the beautiful day. We had such lovely weather the first day we were there. With our minshuku so close, I was able to go in and take breaks with our youngest. We had packed a picnic lunch and ate it in our room and it made life easier around nap time. Even I snuck in a short nap! The next day I went out on the slopes with skiis as did our younger son. 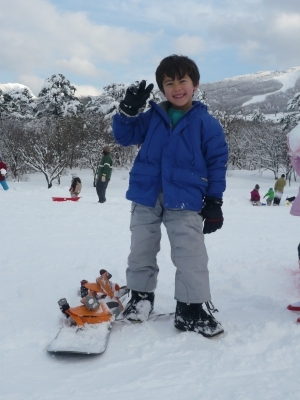 He was complaining of sore knees from falling with the snowboard, so we switched him to skiis. The kids had a great time and we really enjoyed ourselves too. We really want to again. Not sure we can squeeze it in this season, but we will definitely go next year. 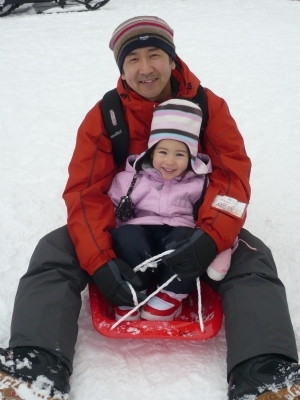 Then maybe our youngest can try skiis! Recently we have been having great weather; warm, sunny days and cool nights. 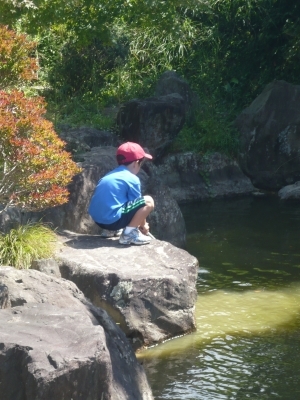 Every weekend we have been doing some sort of outdoor activity with our children. As they get older it is easier to do go hiking, cycling or climb a mountain (albiet a small, nearby one) without dragging along a diaper bag, stroller and all the necessities. The other weekend we went cycling. We had a three day weekend and we went to an area that has a cycling path through the countryside over 20 kilometers long. Of course we couldn't go the whole way, we wandered through rice fields and along small rivers. First we drove to Kibitsu Temple where we can rent bicycles. They aren't anything fancy, just the standard bicycle students and housewives ride around town getting to school and doing errands. One of the adult bikes was equipped with a child seat for Emma to sit in. 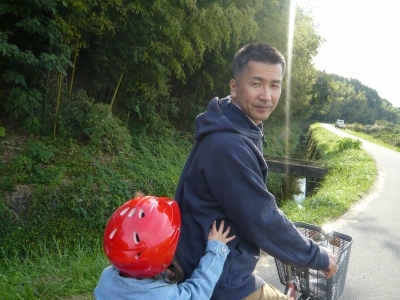 She loved riding on the back of Papa's bicycle, with a great view and an easy ride. Nika used his own bike and zipped along, racing down slopes at one moment then lagging behind the next. Kailo had to rent a bike because he has outgrown his at home (hint, hint Santa). He would try and spot fish in the small rivers that act as irrigation for the rice fields. The local farmers were just beginning to harvest their rice. They have mini size tractors to go through the postage stamp size rice fields harvesting each grain of precious rice. The average age of farmers must be above seventy. I wonder to myself who is going to cultivate rice when this generation moves on? Anyway, we had a great time cycling through the countryside. I am sure we will go again. Can't wait for Emma to be able to ride her own bicycle! Every Spring, Japan has a string of national holidays that, depending on the year, may fall on the calendar just right to give one week of time off. It's a time of year that the weather really is beautiful, not too hot yet, and everyone in the country is out and about. It's also the time of year when koi no bori (carp streamers) are hung out and flown in public areas, homes and elementary schools. It's quite picturesque. Unfortunately, like most national holidays, Japan becomes congested with travellers trying to escape the cities and go to various tourist sites. Hotels and airline companies raise their prices accordingly and we all become ants marching along the expressways, train lines and airports. But, we escaped all of this in to the country. A nearby mountain top has preserved the old fashioned Japanese country home all with the straw roof, fire pit in the middle of the room known as irori and large tatami rooms for sleeping on futons. Our children had a great time trying to catch frogs, red bellied newts, lizards, grasshoppers, katydids....anything they could find. We also saw a number of snakes..more than I have ever seen! There is one type of snake that is poisonous so we have to be careful. My oldest even fed a frog to a snake laying in the sun! Real live experiments for the future scientist. We had a nice time in the small village on top of the mountain. The villagers are hard workers, growing vegetables, maintaining rice paddies and even cultivating chestnuts. I imagine that winter must be tough...snowed in and unable to go down the mountain for days! I know I have written too much about having a clothes dryer in the United States. But I couldn't resist taking a picture of my washing machine and clothes dryer at my house in the United States so that I could show it to my friends. 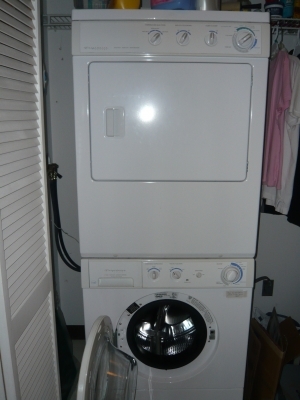 The appliances you see in the picture below are my washing machine, on the bottom and my clothes dryer, on top. They are so convenient and I wish I had them in my home in Japan. Days like today when it is so clear and sunny I would hang out my clothes, but days that are rainy, cloudy or the weather forecast is not so definite, I would wash my clothes any time and at my convenience dry them in the clothes dryer. The clothes dryer is like one in the laundromat here in Japan, with an outside vent to push the moist air and dry the clothes rapidly. They are dry within an hour and fluffy and have few, if any wrinkles. Far different from the all-in-one washer/dryer that I have here in Japan. So living in the country, back in my hometown, presents itself with challenges, most importantly dodging animals that run out into the road, especially at night. The animals that sleep during the day and are active at night (nocturnal) animals especially get run over by cars at night. It's not a pretty sight the next morning. Racoons, opossum, even skunks are often seen on the side of the road, still, hard and cold. These animals are often known as road kill. One animal you don't want to hit with your car is a deer. This time of year, as it gets toward the autumn season, the mating season begins, as does the hunting season. So deer get spooked easily and they are more active. Hitting a deer with a car increases rapidly in the autumn season. 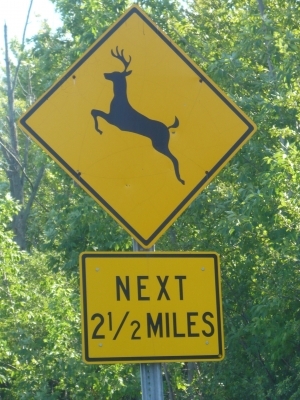 To help prevent this, the Department of Transportation has posted signs including the one below to warn drivers that deers are present in this area. Unfortunately, deer often run out into the road without any warning and do a lot of damage to your car and cause an accident. Be careful driving! So I have been back in Japan for just over a week. I am back to teaching, my children are back to school and day care and we are enjoying the routines of a daily schedule. Our summer in the United States was busy and full of fun, especially for my children who played, played, played every day. Before I left my countryside hometown, I took a photo of my favorite vegetable stand. Just about a 5 minute ride away from my parents' home there is a roadside vegetable stand run by an Amish family (more on the Amish people later). 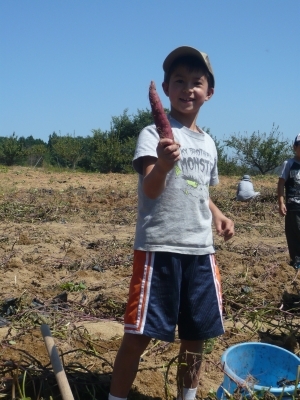 Their vegetables are home grown and picked fresh every morning. They are cheap and delicious. We often buy corn here and eat it right off the cob. 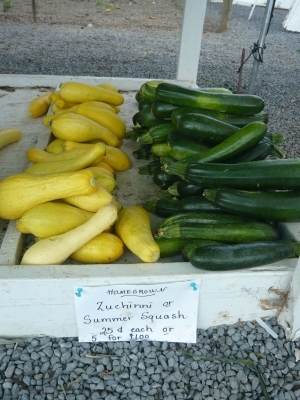 Other vegetables include onions, green and red peppers, zucchini, yellow squash, green beans, eggplant, cucumbers, all the joys of summer. I had to go grocery shopping yesterday (Sunday) and I got all depressed knowing that I had to go to the local grocery store, that to be honest, is not so fun for me. There is not much selection and it is very expensive. As I strolled through the produce section I got so depressed to see the little tiny zucchini that wasn't much bigger than a dill pickle, cost 198 yen (2 dollars). 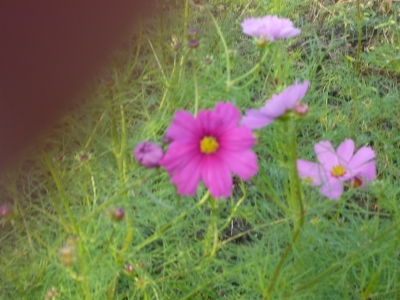 Please take a look at this photo of what I got used to this summer at the roadside vegetable stand. 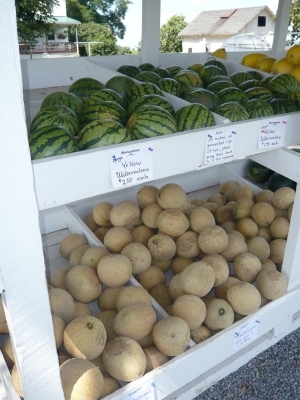 There are also other fresh vegetables there. Check them out! And even watermelon and canteloupes. They are so sweet and delicious! 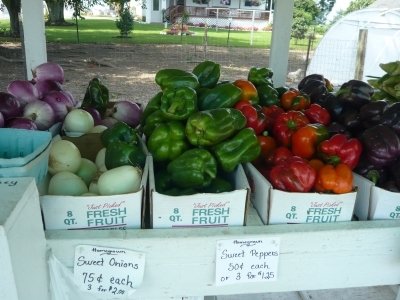 Nothing beats homegrown, fresh vegetables and fruit! Last weekend we drove about 2 hours to a place surrounded by mountains covered in green cedar and pine trees. 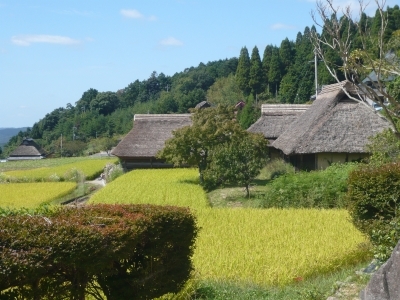 In the middle of this Japanese countryside is a fossil museum boasting the Vicarya fossil. It is from the Cenozoic time period, so fairly "recent" in geological history - much newer than the Jurassic period with dinosaurs. The town is Nagi and there is Mt. 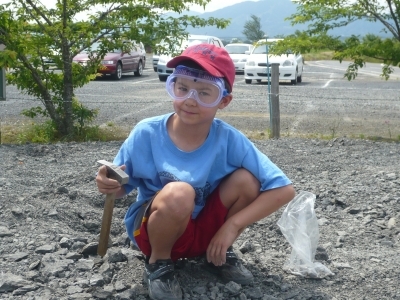 Nagi overlooking this museum, its walking trails, field and the area to dig for fossils. 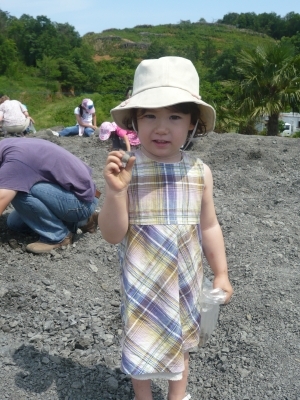 This was actually our THIRD trip to Nagi's Vicarya fossil museum in the last year. My children, especially the boys, love this activity. I think my daughter will enjoy it more when she is older. 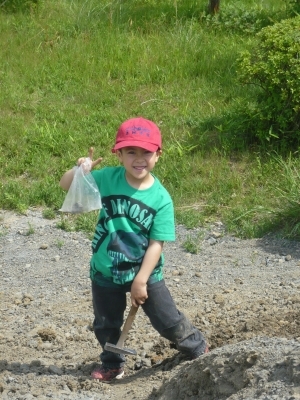 It's hard for a two-year old to focus on searching for fossils for more than ten minutes. My two older have to be pulled away after the one hour time limit is up. Anyway, this was another one of our ABC activities. We went as a group and the museum was very accomodating. They let us use a room to eat our picnic lunch in and there is a grass field outside that we all played soccer on. It was great weather....no rain and not too hot. I am sure we will go again! Why don't you check it out too! In the United States, our first day back to work on Monday morning, we often ask our friends and colleagues, "How was your weekend?" It is meant only as a nicety, and we aren't really asking for minute details, we just want to show an interest in each other's lives outside of work. In Japan, I hardly get asked what I do on the weekend. Most people know I work on Saturdays, but otherwise it is kept as a "secret".....no one wants to pry or ask too nosey of a question, perhaps. I don't mind talking about my weekends, in fact, I think I can get good ideas from other families for places to go and things to see as a family. So today, I will talk about what we usually do on our weekend. We have joined a group of other international families called ABC - Active Bilingual Children. 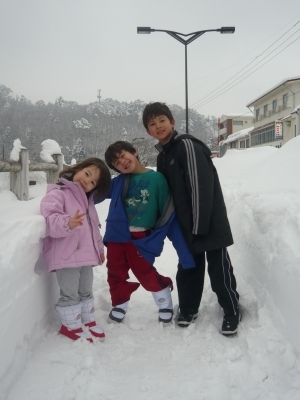 In each family, one parent is a native English speaker and one parent is Japanese. There are families from Canada, New Zealand, England and the United States. We all have children who we are raising as bilinguals and we get together on Sundays in an effort for the children to see that they are not alone...there are other children just like them....of a mixed background. This group was founded by a couple of fathers and we have been so lucky to partcipate in it. It is organized around using English in all skill areas - speaking and listening, reading and writing. So we have a language focus time where our children work with someone OTHER than their parent and read a book, spell words, do a worksheet, some language focus. We also have show and tell and then each parent takes a turn and teaches about a theme that we have established ahead of time. It takes dedication and support from all parents, but it seems to work out well. My kids really enjoy it and they have a ball playing with the other children. We also take trips to various educational sites around the area. We have been star gazing at an astronomical observatory, using a large telescope, visited the planetarium, watched IMAX films on dinosaurs, visited science centers, went to the beach, made home made pizzas, corn bread in a fire pit, all sorts of hands on activities for the kids to explore various subjects. It's been lots of fun and we always look forward to what is next. My son is in second grade at a public elementary school. He wears the traditional school uniform, black jacket with golden buttons, and black shorts. Underneath he wears a white polo shirt and white socks with white sneakers. These are the things I wish the school would CHANGE about the uniform. 1. Colorful polo shirts Allow the students to wear different colored polo shirts underneath the jacket. Decide on three colors and allow the students to wear any of the colors, for example, dark blue, red and green(?). White polo shirts are SO hard to keep clean. Especially with art class that uses colored paints, calligraphy that uses black ink, and school lunches with ketchup and teriyaki sauce! 2. Pants Give several options for students to choose between shorts, skirts and long pants. Allow them to decide for themselves if they want to wear pants or a skirt, shorts or pants, after all what adults do you see these days that wear skirts everyday or shorts in the winter time? 3. Black socks Allow children to wear dark colored socks. White socks are SO hard to keep white! As soon as my son wears his white socks just once, they come home filthy. I have given up trying to take out the stains. 4. No set footwear I wish that my son could wear any footwear he would like to, on the way to school. I mean after all, they take their sneakers off before they enter school, so why not let them wear any kind of footwear? Currently he has to wear white sneakers, but the sneakers they sell as uniform sneakers are of poor quality and they (again) are SO hard to keep white. I wish my son could wear rain footwear during the rainy days, different colored sneakers, warm shoes during the winter, anything he desired. After all he walks a long distance everyday, why not wear shoes that are comfortable and of good quality? It's not that I am against uniforms, I am not....I like the idea of uniforms, I just wish that the system was more flexible. I am tired of trying to keep his WHITE polo shirts, WHITE socks, WHITE sneakers, WHITE hat, bright and white. It's impossible. In fact, besides his school uniform, I don't think he owns anything white, just for that reason, it's impossible to keep stain free! Please, Board of Education, school administartion, PTA members, let's think of some new ways to have our children dress in this new, modern age! (C) 2018 ブログ JUGEM Some Rights Reserved.